"The 'bob' was a blunt haircut for women that was level with the bottom of the ears all around the head. The bob, made popular in the 1920s, was a dramatic change from the long feminine hairstyles usually worn by women during the Gibson-girl era of the early 1900s. The haircut was so popular that hairdressers found it necessary to embrace the style after losing customers to barbers. According to the Washington Post, bobbed hair started a new industry, referred to as the beauty industry. The number of 'hairdressing shops' in the United States increased from 5,000 in 1920 to more than 21,000 established shops and several thousand more 'transient' shops in 1924. After they became more skilled and comfortable with the bob, hairdressers introduced more sophisticated cuts, including the waved and shingled styles popular in the 1930s. Mike's Bob Shop claimed to be among the first in the area to introduce the 'new styles in hair-dressing.' Bobbing led to other hairdressing adornments, including the invention of the bobbie pin." - Text from calendar by Jayne M. D'Donofrio. 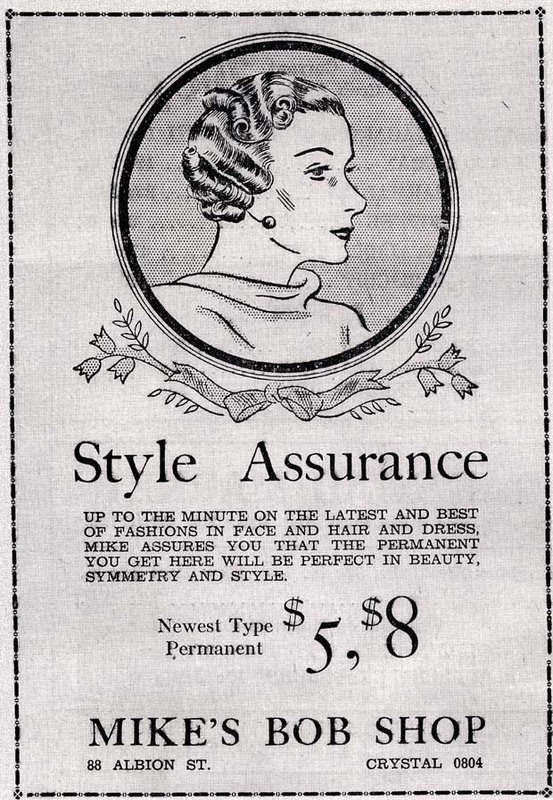 “Mike's Bob Shop, 1935,” NOBLE Digital Heritage, accessed April 22, 2019, https://digitalheritage.noblenet.org/noble/items/show/7032.